Anthropocene exhibit at the National Gallery of Canada, Ottawa. Source: Kheraj 2018. This fall saw the opening of The Anthropocene Project museum exhibitions at the Art Gallery of Ontario and the National Gallery of Canada, and the premiere of an accompanying documentary Anthropence: The Human Epoch. A multidisciplinary, mixed-media project featuring the artistic work of Nicholas de Pencier, Edward Burtynsky and Jennifer Baichwal, the museum exhibitions and film offer different views and representations of the so-called human epoch. We have asked four environmental historians to view the exhibitions and documentary film, and share their thoughts and reflections here. What am I looking at? The question quietly floats into my mind whenever I gaze at one of Edward Burtynsky’s extraordinary landscape photographs. The images are immediately striking and beautiful, but they slowly slip into a terrifying sublime when you begin to realize what you’re looking at: a phosphor tailings pond, coal mining, oil refineries, ribbons of suburban freeways, fish farms, endless rusted roofs of slum housing that melt into the horizon. Viewing these landscapes is a process. First, I find myself searching for the human scale. A car. A person. An animal. Second, I look at the geometric patterns of industrial activity where people carve shapes into the Earth. Finally, I shut my mouth as I usually end up standing there with my jaw dropped. The experience of the Anthropocene exhibit at the National Gallery can be overwhelming. Andrea Kunard, the curator for this exhibit, walked me through each room, showed me the augmented reality features that can be viewed on a smartphone or tablet and shared her own impressions of the work on display. She told me that visitors often leave feeling shaken by what they have seen. 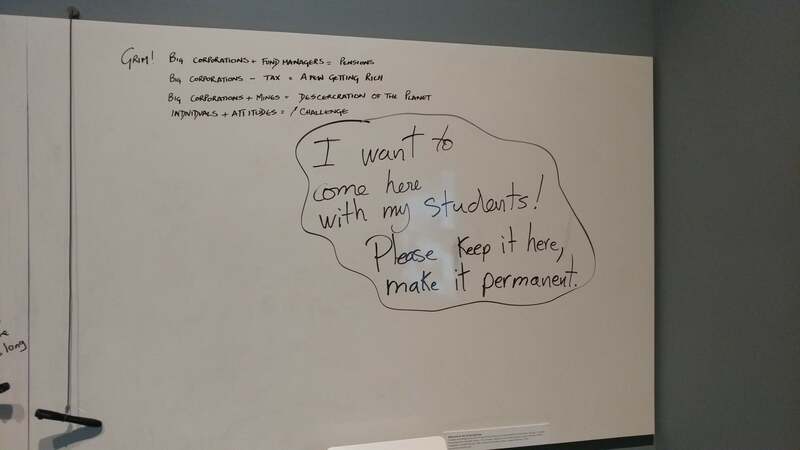 At the end of the exhibit is a room where visitors can write their thoughts on whiteboards. Several people had scrawled messages with various tropes of modern environmentalism: “reduce, reuse, recycle,” “This is a Global Warning,” even a quote from The Lorax. A screen nearby shows social media messages relating to the project. It’s a valiant effort to provide some kind of outlet to share what can be a confounding experience. Visitors to the Anthropocene exhibit share their thoughts. Source: Kheraj 2018. Walking out of the Anthropocene exhibit left me feeling helpless. The scale of the photography (now aided by drone technology to capture breathtaking synoptic views of industrial activity) often rendered the landscapes inscrutable. Where is this place? What are they doing here? How did this happen? Burtynsky’s work and the work of his collaborators is remarkably effective at exposing industrial footprints. The art shocks the mind and leaves you to puzzle out how this came to be. As environmental historians, I think this can be frustrating. I wanted to give context. I wanted to draw lines between the different photographs and videos to reveal the connections. The Anthropocene describes an intersection of history and nature, an environmental history. In many ways, this project is a survey of the outcomes of anthropogenic processes that have been taking place for the past hundred and fifty years or more. But it has little to say about how we reached such outcomes. In February, I will be speaking at the National Gallery in this exhibition about the history of oil pipeline development in Canada. I hope I can add some historical context to this project. My challenge, however, is to figure out if history can help make sense of any of this and leave visitors with more than stunned looks, confusion, and sublime terror. Edward Burtynsky, Jennifer Baichwal, and Nicholas de Pencier’s Anthropocene exhibition is an overwhelming experience. In keeping with Burtynsky’s larger body of work, a dominant theme throughout the exhibit is the scale and appalling beauty of the patterns of anthropogenic change on global landscapes, and their ability to obliterate and transform the heterogenous landscapes that lay here before. The exhibit as a whole becomes a form of difficult knowledge: vibrant and exquisitely constructed but deeply disturbing, the images transfer a burden of responsibility from creator to viewer. My partner and I visited on a Wednesday eve, an open admission night at the Art Gallery of Ontario, and the exhibit space was bustling with a snapshot of Toronto’s diversity: people in couples and groups conversing around us in multiple languages, the space lively but respectful: people are careful with each other in spaces like this, dampening the volume of their conversations, and giving way to allow others an unobstructed view. I was struck by the contrast between the viewers and the images they viewed, in terms of what people are capable of. Harrowing as the images are, they left me with a strange feeling of recognition. In this moment of grossly inadequate global responses to climate change and the evisceration of environmental protections south of the border, I received the images as a kind of solidarity with our work as environmental historians, we who bear a different kind of witness to these events and their development over time. Through their arresting moving and still images, the artists captured the topics and themes of our work: resource exploitation and its consequences, inequities surrounding labour and exposure to risk, vast imbalances in the accumulation of wealth. And here Baichwal and de Pencier’s moving images best complement the quiet of Burtynsky’s work, opening a window into the cacophony of heavy machinery and the underlying violence behind Burtynsky’s stills. In documenting the production of “technofossils” (human-produced objects that cannot naturally decompose) and the use of methods like “anthroturbation” (large scale human tunnelling), the artists introduce a specialized vocabulary to a wider audience and illustrate the dramatic shift of Anthropocene-era technologies and processes. Anthroturbation, for example, is illustrated by one of the most striking and disorienting images of the exhibition: Uralkali Potash Mining, Berezniki, Russia. At first glance, it appears you are looking down upon a landscape from above, a repeated vantage in Burtynsky’s work. Only by reading the accompanying text and looking again do you realize you are within a landscape, observing the spiralling, shell-like patterns left by massive tunnelling machines upon the tunnel walls. Together, Burtynsky, Baichwal, and de Pencier bring distant and rarely photographed industrial places into the comfort and security of an urban gallery. In doing so, they make an esoteric phenomenon—“the Anthropocene,” its technologies and processes, and its vocabulary—comprehensible to an audience that benefits disproportionately from its processes while experiencing fewer of its consequences. Collectively, and relatively, we possess the skills and the social and economic power to act upon what we see. The third of a series of Canadian documentary films by the creative team of Jennifer Baichwal, Nicholas de Pencier, and Edward Burtynsky, Anthropocene: The Human Epoch is the companion to the exhibit displayed at the National Gallery of Canada in Ottawa, and the Art Gallery of Ontario in Toronto. The film provides context to the evocative imagery of Burtynsky’s curated photography exhibits. Sweeping and panned shots capture the beauty of humanity’s impact on the planet, but also a meaningful sense of the scale involved. But the magic of the film is reflected in the way that phenomenal environmental change is juxtaposed with the scale of human lives, experiences, and emotions. Unlike the gallery exhibit, which forces individuals to come to their own conclusions about what they are looking at, the film includes narration explaining the magnitude of the changes captured in the images, and the voices of people at the front lines of creating and confronting the Anthropocene. Anthropocene opens in flames. The world is burning. The tone is set. From here, the film examines seven themes of the Anthropocene: Extraction, Terraforming, Technofossils, Anthroturbation, Boundary Limits, Climate Change, and Extinction. Some of these concepts will be familiar to the audience, others present a new and useful nomenclature or typology. There is much to digest and contemplate in the film, and I have no intention of spoiling it for you. But, what I found most powerful, most emotionally charging, were the images of ivory from more than ten thousand elephants in massive piles. Not something that immediately jumps to mind when thinking about the Anthropocene, the tusks – some of which were longer and heavier than one person could carry – make you empathize with what has been lost and angry about what is sure to happen without a paradigm-shifting change. The audience doesn’t learn the fate of the tusks until the end of the film. Just as it seems humanity won’t learn its fate until the end. This is not an uplifting film. The audience will not leave feeling inspired or equipped to tackle the biggest problems humanity has ever faced. But perhaps that’s appropriate? Perhaps we need to be made to feel guilty? Anthropocene makes very clear that human behaviour, choices, and consumption have a direct relationship with the problems. The implication being that the Anthropocene is not simply a new epoch in the planet’s history, it’s a new era in our understanding of the human species. We see our culture, our values, our history reflected back at us in the grandest scale of environmental transformation. It is not just the world that has changed, but us as well. Culture shapes nature, and in turn, nature shapes culture. We are the Anthropocene. 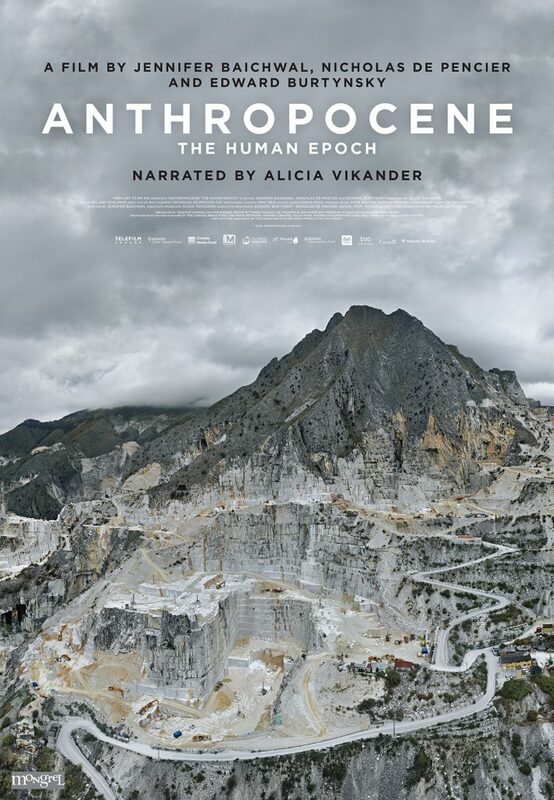 Anthropocene: The Human Epoch is a film that leaves viewers in a state of quiet awe by the time the credits roll. The film by Jennifer Baichwal, Nicholas de Pencier, and Edward Burtynsky highlights many of the ways in which humans have made large-scale impacts on the natural environment to the point where natural and man-made landscapes are indistinguishable from one another. As Andrew mentioned, the film begins with the screen aflame with raging fire, though we do not find out until the end where this fire comes from. It is deafening in its silence on the screen, which captured the climate of the audience I sat among while watching. As the film continues viewers witness stunning imagery and expansive landscapes that are somehow beautiful in a haunting way. Sitting among the crowd, I heard the gasps and expression of shock from my fellow viewers. Whether exposed to the Anthropocene for the first time, or someone familiar with its dynamics, the film presents human impacts on environment in a deep way. With limited narration, the film largely allows the images and video to speak for themselves. The film deals with concepts common to those studying environmental history – resource extraction, climate change, species extinction, agriculture, energy. It effectively demonstrates the scale of the Anthropocene, but the film reaches beyond scale to illustrate the complex human connections tied within the processes it illuminates. It includes voices from individuals who are both resisting and contributing to dramatic human-induced change. A conservation officer speaks on efforts to protect endangered species in Kenya, locals in Russia criticize heavy metal mining for creating a lack of oxygen and greenery in their region, and German miners speak of their relationship with disassembly. Bleached corals in the Seychelles. © Christophe Mason-Parker, Archipelago Images. Without including too many spoilers, there were three cases that stood out to me: The first was the series of images and videos displaying species after species of endangered, critically endangered, or animals extinct in the wild. Through a discussion of poaching and ivory hunting in Kenya, we are reminded that anthropogenic change is a global problem and requires a global solution. Next was the discussion of how climate change has impacted Earth’s oceans and waters. The narrator tells the audience that due to ocean warming and acidification we may likely see the elimination of coral reefs before the end of the 21st century. There is a tragedy is viewing these beautifully complicated ecosystems on the screen while hearing they may be vanquished within this century. Finally, the connections between modernization and consumerism were juxtaposed with walls of technofossils in a landfill. This landfill rose far above the heads of the people who walked through the maze-like structure of plastics and other waste formed. Walking away from the film, viewers feel helpless, deflated, and, perhaps, guilty. It is effective in delivering its message to audiences: we have gone too far. We are all implicated in this. It leaves an impact, and like any effective critical work, Anthropocene creates more questions than it provides answers: Is it too late? Has humanity’s greed and conceit driven us past the point of no return? How can this be rectified? How will we quell our appetite for consumption? Have we truly entered the Human Epoch? The first two films are Manufactured Landscapes (2006) and Watermark (2013). Thanks for putting my feelings about this exhibit into words! Like Jen, I found the Potash mine images the most disorienting.